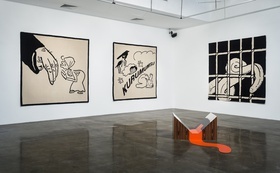 Language Arts (17 March – April 17, 2014) at The Third Line, Dubai, was Slavs and Tatars’ first solo exhibition in the Middle East. In this interview, Ibraaz Editor-in-Chief Anthony Downey talks to Slavs and Tatars about the group’s interest in language, its history and humour, and the central role that language plays in the research, development and manifestation of their artwork. Anthony Downey: We are here today with Slavs and Tatars at their first solo show in the Middle East, which is taking place at The Third Line gallery in Dubai. I want to talk a little to one of the members of Slavs and Tatars about the research behind this show. Payam, I understand your practice is very research-led, although what we’re looking at presently is the manifestation of that in term of objects. I also understand that you do a lot of research into language, the performativity of language, but equally the humour around transliteration and mistakes in language. Could you talk a little bit about that? Slavs and Tatars: I think our interest in language is very natural in the sense that we started off as a book club, and so if anybody wanted to engage with our work for the first two or three years of our practice, they had to pick up a book or read something in two dimensions. 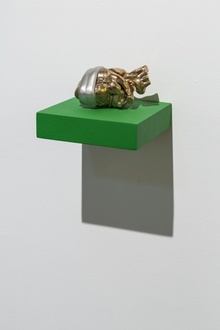 As you mentioned, now there are works that are sculptural installations (like the vacuum forms behind us) and these works look at language and language politics in an effort to, in some ways, emancipate language – the sounds of language – from the shackles that graphemes, letters, and alphabet politics sometimes are. They’re things that essentially are accompanying empires, whether it’s Arabic with Islam, Latin with the rise of Christianity, or Cyrillic with the rise of the Orthodox faith in the fourteenth and fifteenth centuries. AD: There’s a lot of humour behind this, it is about the performativity of language and how language is spoken, but a lot of humour comes into the work too. Could you talk a little bit about the way in which you explore the politics of language through humour itself? ST: Humour for us is a strategy but also a performative practice; it’s almost a way of life in the sense that it’s a way to address difficult, complex or controversial subject matter. When you’re devoted to an area of the world as we are, which is east of the former Berlin Wall and west of the Great Wall of China, you have to understand that for most people – whether they’re in the Middle East or in the west – it’s an area that strikes them as obscure and remote. Humour is a way – in the same way that celebration, hospitality and sometimes pop culture are – to meet our audience half way, so it’s a generosity. Humour is a way to deliver a critique but in a disarming way. I think when we’re devoted to a region or a geography, it’s as much about redeeming a sense of behaviour as well as thought processes about this geography, and one of the ways in which to do that is the delivery of critique through humour, Molla Nasreddin being the best example. In fact, some of the best, most effective critique is delivered through the biting satire of Mullah Nasr al-Din, or as George Orwell said, ‘every joke is a tiny revolution’. Slavs and Tatars, Language Arts, 2014. 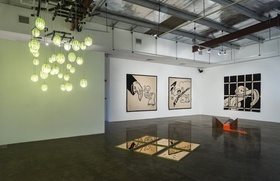 Installation view at The Third Line, Dubai. Courtesy the artists and The Third Line, Dubai. ST: The reason why we’re devoted to this region – and I should say of course it’s a geography which is as imaginary as it is political and real – is that if we’re going to believe the nonsense that all too often passes as wisdom these days, which is that the east and the west are somehow on a collision course, or that Islam has an issue being integrated with modernity (which we don’t believe in at all), the best thing we can do is to look to this region where the opposite has been the case. It’s a counter-argument; whether you look at the Balkans – let’s look at the long history, forget the Balkans in the past 25 years, but the Balkans of 500 years – or whether you look at Central Asia where you have synchronistic Islam, or the Caucasus where you have the mountain of languages. Our region, whether it’s the former Soviet sphere or even Turkey itself, largely the Turkic languages have undergone devastating changes in alphabets. It’s almost quite schizophrenic in the former Soviet sphere; you had Lenin who believed that the revolution of the east was to Latinize all the Muslim subjects of the Russian empire, so in ’29 they were all Latinized. That means everybody from Kazakhstan all the way to Azerbaijan, Kyrgyzstan, everybody who was Muslim – never the Christians, never the Armenians or the Georgians, for example, because Lenin, like Atatürk, believed that the way to push the Muslims of the Russian Empire or the Soviet Union into modernity was to separate them from their Islamic, Arabic past. Then in ’39 Stalin changed it to Cyrillic because in the interim Turkey had also Latinized, so there was this fear of pan-Turkism. In ’39 again everybody gets out their books, burns them, and changes from Latin to Cyrillic. And then in ’91 with the fall of the Soviet Union it goes back to Latin. So you have this very tragic situation where three generations speak the same language but can’t read or write the same book. People become immigrants within their own countries, in some sense. AD: It seems to me that a lot of Slavs and Tatars’ practice is about an archaeology of language, in some sense. It’s about phonetics, what was elided at a particular moment in time, and, indeed, what has re-emerged due to various political circumstances and various political discourses. Would that be a way of reading the manifestation of how you work with language in a visual sense, in context of these works? ST: I would hope so. I think that languages, like books in general, are talismans; they have an effect that you don’t necessarily capture or understand given the circumstances. For example, if you read a book at fifteen or fifty, if you read a book when you’re in love or when you’re heartbroken, it has a different effect on you. Language is similar; when you learn a language, you don’t know what it is going to bring you, you don’t know what it means to actually expropriate yourself. There’s this idea of linguistic hospitality that Paul Ricoeur talks about, putting yourself in the language of the other and bringing the other into your language. This idea is quite relevant to Islam and the notion of expatriation in Islam, this notion that you have to take yourself outside of yourself as far as possible to come back into yourself. The artworks, these physical manifestations of this research, in some sense they’re successful when they are like talismans, when you don’t know what to do with them. You don’t know whether you should sit on them or not sit on them, you don’t know whether they’re sacred or profane, you don’t know whether they’re real historical research or whether they’re fictive fabrications, and I think that slippage is something that’s important to maintain as much as possible. AD: It seems that what’s absolutely critical to this practice is this notion of when things collide; when languages collide, when histories collide, seems to be absolutely integral to the practice itself. ST: It is. There are a lot of words for it in English, all of them sound quite pretentious: amphibolies, coincidentia oppositorum. We call it the metaphysical splits in the sense not of the splits of the leg, but the splits of the mind. How can you bring together in one page, one register, one voice, two things which are considered to be antithetical? Whether it’s our own bio, from the former Berlin Wall to the Great Wall of China, or whether it’s combining political Islam and Communism, Marx and Muhammad, like Norman Brown did – they’re two people that you don’t normally put together in the same phrase. I think that actually this notion of amphibolies or the metaphysical splits is something which is quite relevant to Sufism as well, because Sufism, and also Russian philosophy, believes that when you try to express the transcendent or the mystical or the metaphysical, you have to do so by resorting to the irrational, because the rational is the work of the devil and of man, of this world and of the profane. There’s that great Thomas Merton quote which does that, where he says: ‘Quit this world, quit the next, and quit quitting’, and you have this collapse on its own self. It’s only through the combination of things which are considered to be illogical or irrational that you can somehow move towards the holy other. AD: Let’s look at how that works in visual terms; we’re going to look at a specific work by Slavs and Tatars, Dig the Booty (2009). Payam, we were talking earlier about the transliteration involved in language, the way language is a mode of exchange, but equally how there are slippages between words, between phrases inherent in language. This work examines precisely this notion of slippage between language, but equally this notion of transliteration. Could you talk a little bit about this? ST: Sure. Dig the Booty is quite an important work for us; it’s the first time we addressed transliteration head on. Essentially it’s an aphorism that we’ve created, it says: ‘Dig the booty of monoglots, but marry, my child, a polyglot’. What it means essentially is that if you’re going to have a one-night stand or just some fun for one night, better to do so with someone who speaks one language, but if you’re going to get serious and settle down and fall in love, better with someone who speaks many languages. In some ways it’s quite exemplary of our practice, in the sense that, again, you have the collision of these two registers and languages. People who usually use phrase ‘dig the booty’, the slang on the street, don’t end the phrase with ‘monoglot’ or ‘polyglot’, right? But it’s also not translated, it’s transliterated, so you have it here in Cyrillic, and the same in Arabic or Persian script. We call transliteration the trashy younger sibling to translation; translation is noble, Nabokov did it, departments are devoted to it, but transliteration is something which nobody thinks about but which we all in fact do on a regular basis. If you speak or read or write a non-Latin based language, chances are you’re writing your emails in what is called ‘Greek-lish’ (Greek and Latin letters) or ‘Fin-glish’ (Farsi and Latin letters). It’s a form of expediency, as opposed to translation. This whole series of vacuum forms is called the Trannie Tease, and this word Trannie Tease plays on ‘trannie’ from transvestite – actually, transliteration is the transvestism of language. Again, if translation is this idea of linguistic hospitality, of putting yourself in the language of the other and asking the other to come into your language, then transliteration is putting on the clothes of the other language but not actually changing the language. ST: It is, and I think that identity as a performative gesture always implies, as you mentioned, a pluralism of identities – it’s never fixed. For us, the very name Slavs and Tatars implies a range of identities that incorporates more than 300 ethnicities, if you take the former Berlin Wall and the Great Wall of China. I think the question of identity politics is one which we try to collapse by indulging it; instead of avoiding identity politics and acting like it doesn’t exist, the best way to address identity politics or simply undo it is to accumulate as many identities as possible. When you have to negotiate between Iran, the United States, Russia and Poland, you have to resolve those conflicts internally, within oneself, so it’s necessarily a notion of compromise but compromise as a strength and not as a weakness. AD: Thank you. Let’s have another look at this notion of collapse, and we’re going to take a look at another work across here. Payam, we’ve been talking about the collapse of languages, the way in which languages become elided, forgotten, submerged, and this series of carpets work with Turkic language and its re-emergence in certain forms. Could you talk a little bit about the significance, for example, of the letters that come through here? ST: This series of carpets are called the ‘Long Live’ carpets, and the carpets use Mayakovsky drawings in which we intervene and address issues of language politics within the Turkic sphere. In fact, the Latinization of the Turkish language is the most successful example of the conversion of a script, at least in recent history. Even the most Salafist Turk doesn’t ask for the return of the Arabic alphabet, it’s kind of a done deal. When Atatürk Latinized Turkish there were the ideological reasons for it, which were to the push the country into a more western mind-set and towards modernization, but the ‘rational’, scientific approach behind it was to accommodate vowels that the Arabic script couldn’t accommodate. Turkish has nine vowels, Farsi has between three and five, and the vowels we know the most often of course are the ‘ö’ and the ‘ü’. What we rarely talk about or think about is that when you change an alphabet you also lose certain sounds and certain letters, and these [on the carpet] are all the letters and sounds that we lost with the Latinization of the Turkish alphabet. So you have the ‘ghein’ and the ‘ein’, but also you have a favourite phoneme of ours, the second ‘n’ – in Turkish you had two ‘n’s; a normal ‘n’ like ‘Nancy’, and you had an ‘n’ which was like an ‘mm’, which sounds quite Asian. So through the prism of this one phoneme you can again emphasize the Asian heritage of Turkish, which is a language that has been trying to Westernize as much as possible by removing Arabic words and removing Persian words and replacing them with French or other words. And of course the Turkish language is a language that doesn’t come from Anatolia, it comes from the furthest point from Anatolia on the continent, from Mongolia. AD: We’re talking about language as a form of accommodation, about language as a way of integrating people in a manner that politics seems to work against. It seems that language offers a sphere within which to operate differently, or at least to accommodate other people or other beliefs into a broader system. Would that be a fair assessment of these works, or a fair assessment of the research? PS: Absolutely, and I’d say it’s not only a fair assessment of the research but also of the position we take, because our work is research-oriented but it’s also quite polemical at the same time. Our take on this research is how can we emancipate language, phonemes, and sounds from their transactional, profane use, and maybe think about language as a sacred form of knowledge. That’s what we did in the book Khhhhhhh, for example, or here [with the carpets], maybe liberating the sensual approach to language. If you think about all the organs of language, the tongue, the nose, the ear, the throat, the teeth, the lips, they’re all quite erogenous organs, but we tend to think of language – like many things – with kid gloves, kind of sceptic and very clinical. Slavs and Tatars. “Slavs and Tatars in Conversation with Anthony Downey.” Interview by Anthony Downey. Ibraaz. Ibraaz, 30 Apr. 2014.